Ankle ligament reconstruction is a surgical procedure that tightens the outside or lateral ligaments of the ankle. 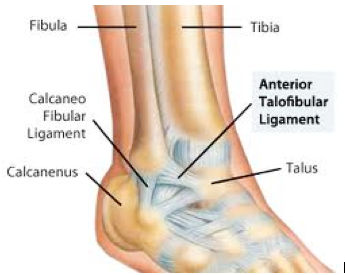 There are two major ankle ligaments that stabilize the lateral ankle, the anterior talofibular ligament and the calcaneofibular ligament. This surgery is intended for active, healthy patients who have experienced frequent ankle sprains which has led to chronic ankle instability and pain. Non-operative treatments include physical therapy and supportive ankle braces. For some patients with mild or moderate ankle instability, these non-operative treatments are sufficient to resume activities, and an operation is not necessary. However, for patients who remain symptomatic after trying conservative therapies, surgery may be considered. At the time of the operation, the quality of the lateral ligaments is evaluated to determine whether your own ligaments can be used for the reconstruction by tightening them (detaching them and reattaching them in a tightened position). If the ligaments are severely damaged, an allograft (cadaver) tendon is used to reinforce the damaged ligaments. Depending on the severity of your ankle instability, either one or both of the major ligaments are tightened (reconstructed). This is an extremely effective procedure which allows patients to resume activity that was previously limited by ankle instability. When your surgery has been scheduled, you will be given a pre-surgery packet including information on location of the surgery. This procedure is performed at an outpatient surgery center. Patients over the age of 50 and with certain health conditions will require a blood work-up and EKG. Blood thinners should be discontinued prior to the surgery. This includes Coumadin, Plavix, aspirin, anti-inflammatory medicines (ibuprofen, naproxen, Aleve, Motrin, diclofenac, etc. ), glucosamine, and herbs that may cause thinning of the blood. If you are on prescribed medicines such as Coumadin or Plavix, meet with your primary care doctor prior to discontinuation. This procedure typically takes 1 1/2 hours. If an allograft tendon is needed, the procedure may take closer to two hours. You are required to be at the surgery center 1 hour before the scheduled start of the procedure, and will need to stay in recovery room for approximately 1 hour after surgery. You will undergo general anesthesia for this procedure and you will also receive a regional block. This is a process in which the anesthiologist injects numbing medicine into a nerve in the back of your knee, providing pain relief for the first 12-24 hours after the surgery. You will have an opportunity to speak with the anesthesiologist about the general anesthesia and block prior to your surgery. You will be provided with a prescription for pain medicine at the time of surgery or at your pre-operative evaluation. If you would like your prescription before the surgery, contact the office two weeks prior to your scheduled procedure. These types of stronger (narcotic) pain medicines cannot be called into your pharmacy. Most patients are able to wean off of the pain medicine within 1-2 weeks of the surgery and transition to over-the-counter (OTC) analgesics (anti-inflammatory medicines or Tylenol). Most of the pain medicine we prescribe contains Tylenol (acetaminophen or APAP). Therefore, Tylenol should not be taken in combination with the pain medicine. It is recommended that you do not exceed 2 grams of Tylenol/day. The pain medicine we typically prescribe contains either 325 mg or 500 mg of Tylenol (APAP). Some common side effects of narcotics include itching, nausea and constipation. Should you experience these side effects, there are medicines that can be prescribed to counteract them. Because constipation is so common, consider starting an over-the-counter stool softener such as Colace when you begin taking the pain medications. Also, maintain a high fiber diet (25g/day for women and 35g/day for men) and stay well hydrated. After the surgery, you will be placed in a non weight-bearing (NWB) plaster splint. You will be given crutches at the surgery center. If you have difficulty using crutches, you may want to obtain a knee scooter or roll-about from a medical supply store. Most insurance companies do not cover the cost of a knee scooter, though a prescription is often required. Please contact the office at least two weeks in advance if you would like a prescription for a scooter. It is recommended that you keep your leg elevated above the level of your heart most of the time for the first 72 hours after your surgery. This will decrease both swelling and pain. Keep dressings dry at all times. For showering, consider covering the splint in a garbage bag, securely taping the edges. Alternatively, you may obtain a cast-cover at the office, and they are also available at the office and at most drugstores. They cost approximately $30 and are reusable. Do not attempt to remove the splint at any time. This appointment may be scheduled prior to your surgery. The post-operative splint will be removed and the incision will be evaluated at that time. If the wound has healed, sutures will be removed. You will then be placed in a NWB fiberglass cast. This cast will be worn for approximately 3-4 weeks. It is essential that you stay off of your operative leg during this time. Your second post-op appointment will take place 3-4 weeks after your 1st post-op appointment. During this appointment, the fiberglass cast will be removed. You will then be fitted with a removable walking cast (CAM walker). You may start weight-bearing as tolerated (WBAT) as soon as the CAM walker is placed. Consider partial weight-bearing (starting out placing about 50% of your weight on the operative leg), increasing to full weight-bearing (not using crutches) over the course of a few days. It is recommended that you wear the CAM walker at all times, including nighttime, for the first two weeks. However, it may be removed to shower. You may also remove the CAM walker a couple of times a day to perform gentle range of motion exercises with your ankle (up and down movements only). After two weeks of wearing the CAM walker, you may discontinue wearing it at night. You must continue to wear it during the day and whenever weight-bearing. Most patients start physical therapy (PT) after two weeks of wearing the CAM walker (approximately 6 weeks after surgery). You will be given a prescription for PT at your 2nd post-op appointment along with a list of physical therapy locations near your home or work. You may start using the stationary bike at low resistance at this time. During this appointment, the CAM walker will be removed and the stability ankle will be assessed. You may “wean-out” of the CAM walker over the course of a couple of days. Physical therapy will continue twice a week for 2-4 more weeks. You will get the most out of physical therapy if you perform the exercises at home on off days. You may start using the elliptical machine. If you are pain-free on the elliptical, you may start walking on the treadmill. High impact activity including jogging, jumping, and walking on uneven terrain may be attempted no earlier than 4 months after your surgery. We recommend gradually introducing these activities. Elevated temperature: It is common to experience a low-grade fever for up to 3 days following surgery. If you think you may have a fever, take you temperature with an accurate thermometer. If it is remains elevated above 101° F for more than 12 hours, or you if are still experiencing a temperature above 100° F more than 3 days following surgery, contact the office. You may take anti-inflammatory medications for the elevated temperature. Pain: For the first several days after surgery, you may experience moderate-severe pain that responds to the pain medications you have been given. If the pain remains severe despite the pain medications, contact the office or the anesthesiologist at the surgery center. The pain will significantly decrease within a week following the operation. However, it is common to experience some amount of pain for up to 2-3 months after surgery. This pain is usually mild and occurs after increased physical activities. You can apply ice to your ankle or take anti-inflammatory medications of this occurs. Calf atrophy (decrease in calf size) due to long period of immobilization. This will improve as you perform rehabilitative exercises and resume activity. Swelling: Ankle swelling may persist for several months after the surgery. Anti-inflammatory medicine, ice, and/or compression with an ACE bandage or compressive stocking may help to reduce swelling. Ankle stiffness: Will improve with rehabilitation exercises and resuming activity.